I'm in the process of knitting a jumper 'freehand', i.e. without a pattern. I started from the bottom edge, knit in the round up to the armholes, split the knitting, continued to the top of the shoulders, and then did a three-needle bind off to join them. The problem is that now I've got that far, I can clearly see a flaw in the earliest part of the jumper which wasn't apparent before. For the first ball of yarn, I was knitting much more loosely, so the first few inches bell out a bit, sort of like a skirt. The obvious solution is to unravel the offending portion and re-knit. I have plenty of yarn, so wastage isn't an issue. Normally I make socks or lace, so large pieces like this are less familiar to me and I did a bit of research to make sure I don't mess it up. It seems I have two main options. Option 1: Cut the bottom piece off just above where it flares out, re-knit the entire bottom portion as a separate piece, and graft it back on. In one sense this is the simplest since it involves repeating the steps I've already done, except for the grafting. I really don't like grafting, and the yarn I'm using is very fluffy and hard to read the stitches, so I can see this being a real nightmare. Option 2: Again cut off the bottom piece, but just pick up the raw stitches and knit downwards until it's long enough. I prefer this idea, but I know that this technique means that the new knitting will be offset by half a stitch. The pattern is k2p2 rib, and I'm worried that there will be a visible line at the join. I did try knitting a swatch to test it and I couldn't see a noticeable join, but like I said the yarn is very fluffy and it hides a lot of the detail so it's possible it would only be visible after I finished and it was hanging down, just like the original problem. I've done a lot of searching for the answer to this, and it's possible that I'm missing some search terms which would help find it, but so far I've had no success. The closest I've found can be seen in this article: How to undo your knitting - it does call out the problem of the offset stitches but doesn't specifically address how rib will behave in this situation. You're correct in that the fluffiness of the yarn and the colour of the jumper should hide the offset to some degree. Most people won't pick up on the change unless they are looking really closely (and really -- who does that?). There is no problem with either strategy. For 1), this is what I did on my last jumper. 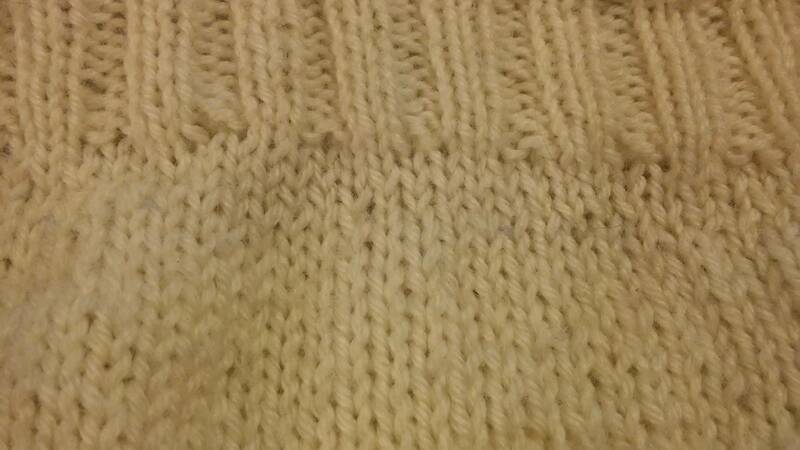 I had miscalculated the row height and knitted it too long, so to shorten it, I cut it through, unravelled 5 cm and grafted back the old (ribbed) bottom. Grafting was done about 3 rows from the rib. It is somewhat more visible in reality than on that bad quality picture, but it is still very good and not really noticeable when wearing it. It is certainly less noticeable than the Russian joins throughout the jumper. This is Norwegian wool (not merino), a fluffier yarn will be even more forgiving. For 2), this happens all the time in machine knitting. Ribs are done on a different machine or by hand, and then grafted onto both the top and bottom part of flat knits, or live stitches on the bottom picked up and knitted in rib by hand. A very experienced knitter will be able to tell the difference after close inspection, but it is not inherently ugly even when noticed. A third option would be to do nothing. Many patterns have an intentional A-line fit or a waist-nipped fit, and your ribbed sweater will snug onto your body anyway, so it will be already wider at the hips. Sure, these fits are normally done by reducing stitches, but changing the needle size is also a legitimate way to do it. In your case, it was loose knitting instead of larger needles, but nobody can tell the difference. Also, don't forget - when you walk through the streets, maybe about 5% of the people you meet are even aware that sweaters can be raglan or set-in sleeves, and even among those, most will take no note of your jumper. And that's for a fairly visible clothing construction characteristic. If you feel self-conscious wearing a sweater with an offset rib, remember how insignificant it is for those who see you in it.